When all through the house, not a creature was stirring not even a mouse. Our flight decks were charged and wings were all packed with care, in hopes that NO PRESIDENTS will ever be there! Yes, Hawaii Monkeys there is a Santa Clause, it took 9 years for our letters to be answered as even he was not allowed to fly during Christmas while Obama was here. 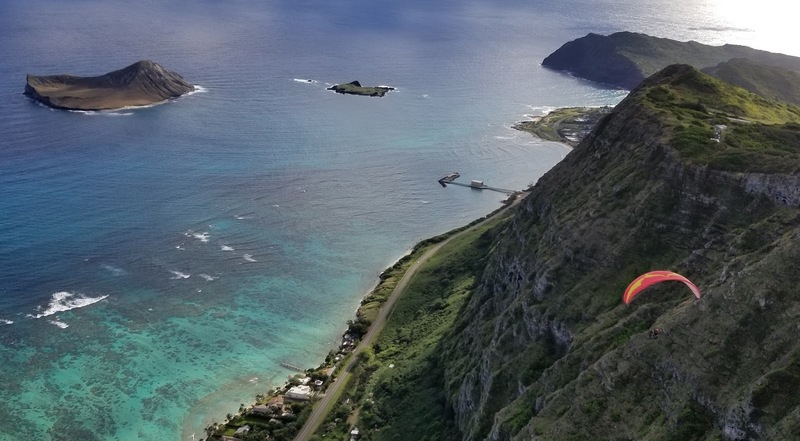 On Christmas day 2017 flights were had by many as Christmas cheer was spread from Makapuu to Lanikai with a few landings in between. 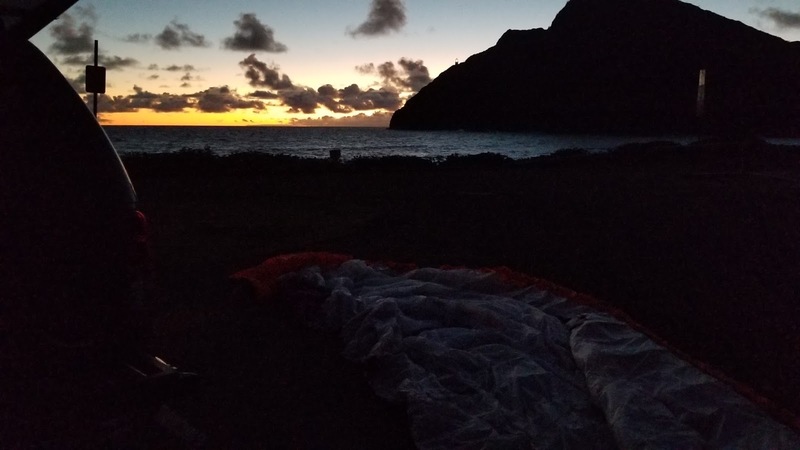 from a pre-eve night at Fort Gravity, but it made me go to bed early and a dream of a dawn patrol flight was text to me just before closing my eyes. 5 a.m. I snuck out of house passing Maui Tim asleep on the couch, which later I paid for it by not getting intel to fly Lanikai. Arrived at Makapuu LZ the tattered sock was blowing perfectly. It was still too dark as I drank my coffee and laid out my wing. Checked out Manics too strong so away to Crazies I flew like a Flash, no it was not Flash it was One-Eye. Now at least I had company. Jim made the call, Juice is the launch. Early morning flights are something to cherish. A good launch and spectacular view were thwarted by a stubborn stick in my line. Rats to the LZ to clear this bugger. Perfect timing as I was packing up, SB Reece pulled in. I had to hold my wing on my head in her little red sleigh but I didn't have to walk back to launch. One-Eye was in the air with sugar plumbs dancing in his head, "Really nice up here." Reece was next Southern Belles first of course. With a twinkle in her eye, a pull and a turn, I thought I heard her say as she flew out of sight, "Merry Christmas to y'all and may y'all get a good flight." Well, I was next and I caused some clatter, thankfully Legend Goldberg sprang up to see what was the matter. He fluffed my wing and after a few botched pulls I was back in the air. Below I could see Frank hiking up while John Goldberg launched but no more monkeys. Why do they still think there is a TFR? Obama is here but his potus status has been revoked.Where was every body? 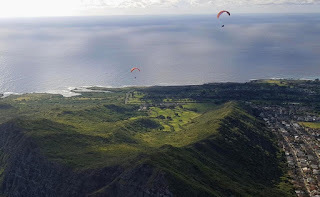 Reece wanted to fly towards Puu Kona, she got an early present, a harness that finally fits, she felt comfortable enough to venture from the play ground. We got mostly there but I looked at my NAV, 33 miles an hour, must be going a bit more east. Both with good altitude I thought we could make it back. But alas the head wind was fierce, she had to set down at Pope Elementary. down at iron woods, I have been here before didn't work out so well as I remember. I turned toward the beach and got a few bumps up. I called daughter Maile she was on the beach at Waimanalo, I told her to wave, she did and I set up to land. Best out landing I have had since being re-born to the air. Having my 2 beautiful daughters cheering for me and giving me a hug after was the best present ever. One-Eye had landed and offered a ride but I was able to get lift from the girls and we grabbed Reece on the way. 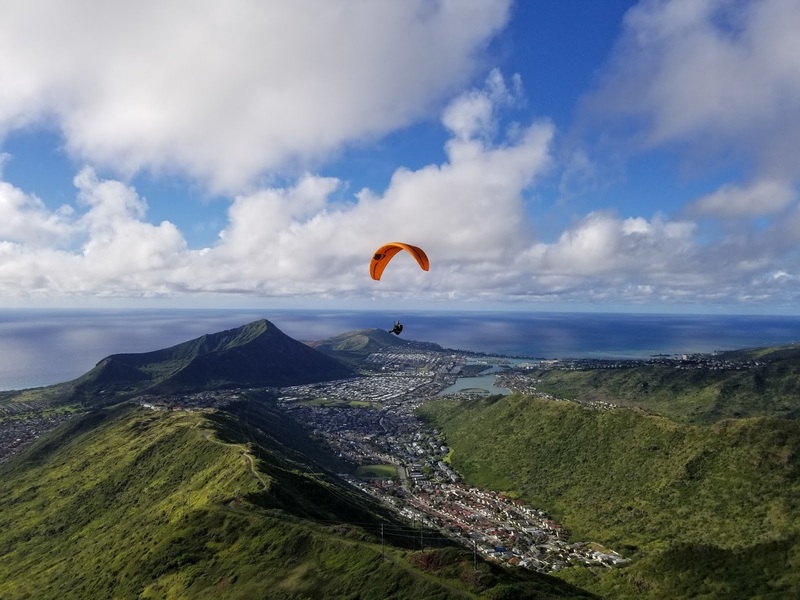 While riding to the LZ in the back of a pick up with Kalei, Maile and Reece she gave us a quick debrief of her perfect landing in the playground but found that the gate was locked to get out, which didn't diminish the smile of that happy flight. Pilots were landing as we approached, it was getting too east. Joey had to hit the beach flying past the tower with his thumbs up, the life guards grinned knowing a cold, tasty fine for landing on their beach would soon be under their tree. Others on Juice hiked down. Maui Tim and Fiore arrived just in time for the shut down and said they were off to Lanikai....I looked at Tim, "Hey give me a call if its good". Had a funny feeling that call wouldn't come after I left him sleeping and got one of the only flights at Makapuu. But I did get a call after they landed for a ride after their hour flight at Lanikai swooping over the Pill Boxes, high fiving etc. ok Tim you got me back. Grabbed them just then Garret called Makapuu is back on. It was a little bumpier but I got to fly with Fireman Dave and Superman. We also got to watch Fiore throw down some awesome Heli's and Sats and all kinds of crazy acro. Garret was be bopping too on his new Gradient toy. Finally a Christmas to remember, not the commercial Christmas that I find disheartening, but that of family and friends getting to share in the joy of flight. Even Santa exclaimed "Now Jim, Now Reece, Now Thom and John! On Frank, on Joey, on Garret, on Tim and Fiore! Then Dave, then Tommy and Garret too! To the top of the launch, to the top of the clouds now dash away! dash away! dash away all! Then I heard as he flew out of site. "Monkeys, Monkeys Its Time to Fly No More Christmas TFRS So, Get Your Gear and Go!!! Merry Christmas Thom! What a great Kwanzaa Coffee read! Glad to hear about the good Christmas flights! Hope to be joining you guys back in the air soon. Twas the flight of your Christmas! Thanks for sharing Phoenix! Geronimo and I were freezing on the mainland, where tho the flights get to 30k, they are neither free nor feel like freedom. The para-waiting can be extra arduous (spent 26 hours waiting in Atlanta under either indoor smoke or grey skies). And the family extreme sports activities can leave you crippled -- I'll be on injured-reserve for awhile from a bowling injury. Merry Christmas and Happy New Year Thom and everyone! May there be blue skies and happy flights for all.